A twist on a chicken sandwich. Hard to believe but true. It’s a bold statement and I don’t blame anyone who just hits the back button when they see the title. But it’s true. It’s not the bread and it’s not the toppings. It’s not the condiments – no wonder ingredients in the mayo. No garlic, chipotle, anchovy, caper, lemon or anything else. It’s the chicken. Every chicken sandwich starts out with the same thing. Boneless, skinless chicken breasts. I would like to know why. Is there a less interesting piece of protein anywhere? OK – maybe tofu but does that really count? Just don’t buy boneless, skinless chicken breasts. Twice the price, half the flavour and prone to drying out when you cook them. Buy bone-in, skin-on and bone them out yourself and leave the skin on. Added bonus, throw those bones into a freezer bag and make stock down the road. Leave the skin on. That’s the twist. 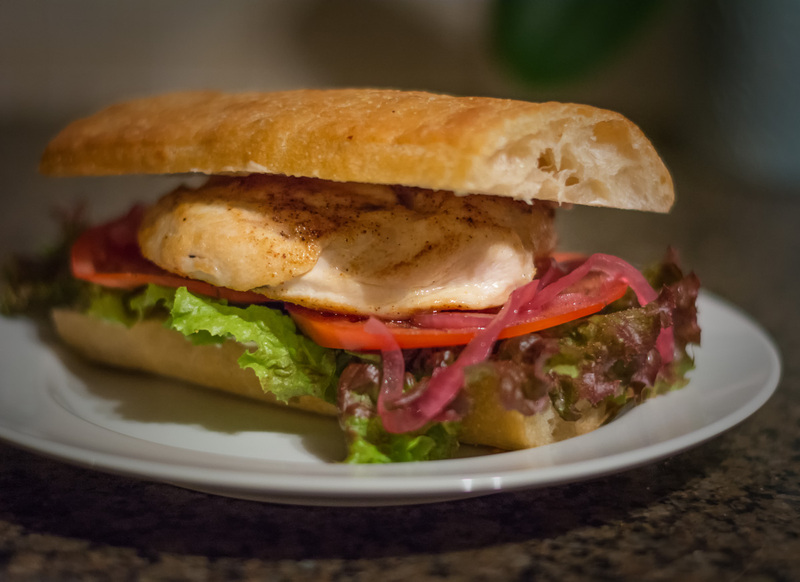 It protects the chicken as it cooks, it tastes fantastic and it adds moisture to the sandwich. You have to add moisture and mouthfeel to the sandwich somehow. Butter, olive oil, mayonnaise or chicken skin – it has to be there or you’re eating dust. There’s no recipe here. Just a guideline. Make the sandwich that speaks to you. The one in the picture was chicken seasoned with creole seasoning, pan-fried and finished in the oven. Good bread, summer tomatoes, lettuce, mayo and pickled onions. Simple but delicious. Do what suits your ingredients and your mood. Bone out the chicken breasts, leaving the skin intact. Place the boned chicken breast skin side down and butterfly it, being careful not to accidentally cut the breast into two pieces. Leave yourself the equivalent of half the thickness of the breast. Now flip the breast open with the skin side up. The skin won’t cover the entire butterflied breast but that’s OK. Season both sides of the breast with whatever works for your sandwich vision. At this point you can grill, pan-fry or roast the chicken. I like grilled or pan-fried. If you grill, remember you are playing with fire. Chicken skin causes flareups. If you go the pan-fried route, heat a skilled over medium heat. Add enough oil to film the pan and place the chicken skin side down and cook until the chicken is lightly browned. Flip the breasts skin side up and put them into a 375F oven. Cook until you get an internal temp around 165-170F – probably less than 10 minutes. Make your chicken sandwich. Enjoy. The details are the things that matter in cooking too. Always keep that in mind. In bbq and grilling, main course, poultry. Bookmark the permalink.